Why does a century-past story of a steamship sinking in the North Atlantic inspire millions to watch films and read books today? Is it because we recognize the names of Astor and Guggenheim among the victims? Or is it because the story of people from all walks of life, heroically facing an unexpected and undeserved end, helps us cope with the tragedy of September 11th? Or rather because we hope, with tears streaming down our cheeks, to play with the greatest passion of our lives on the deck at the moment of our own end? Relational thought pervades the grand and mundane of our lives, allowing us to make comparisons to what we already know, and critically make inferences that can guide our future actions. Will the US Supreme Court find universal healthcare to be, as one justice remarked, like forcing people to buy broccoli, or as President Clinton suggested, like the law of the post-revolutionary war period requiring individuals to own guns for protection from foreign invasion? Are the Iraq and Afghanistan wars more like World War II or Vietnam? Scientists extend principles of the solar system to understand subatomic particles, while math teachers demonstrate a balance scale when teaching students how to balance equations. Such activities depend on the systematic deployment of memory and reasoning with an appreciation for the structure that lies beneath the surface. Set at the crossroads of developmental psychology, cognitive neuroscience, and computer science, my work seeks to understand such relational learning and reasoning. Using category learning and analogical reasoning, I am investigating how executive functions and knowledge interact in relational thought throughout the lifespan, and how developmental changes are supported by the neural networks of the brain. Executive function is critical to our ability to learn and use accumulated knowledge in the service of reasoning, underlying the ability to maintain, manipulate, and monitor the contents of our conscious mind, allowing us to implement goal-relevant actions. These functions undergo enormous developmental change, greatly improving in efficiency into early adulthood, and then gradually declining for the remainder of life. In contrast, relational knowledge accumulates throughout our lives, showing only modest decline in our last years. Thus, relational thought also provides a core domain to investigate how the complex neural networks of the brain change as a result of maturation and experience. What do brain areas associated with relational processing do, and how do they work together to enable relational thought? How do changes in neural architecture affect the development of relational thought? Can neurocognitive measures of relational thought and executive function be used to optimize learning and reasoning throughout the lifespan? Addressing these questions using behavioral and neuroimaging methods within a computational framework, I hope not only to contribute to an understanding of how brain maturation and experience impact relational thought, but also suggest possible methods for detecting the best strategies for intervention to improve relational learning and reasoning throughout the lifespan. 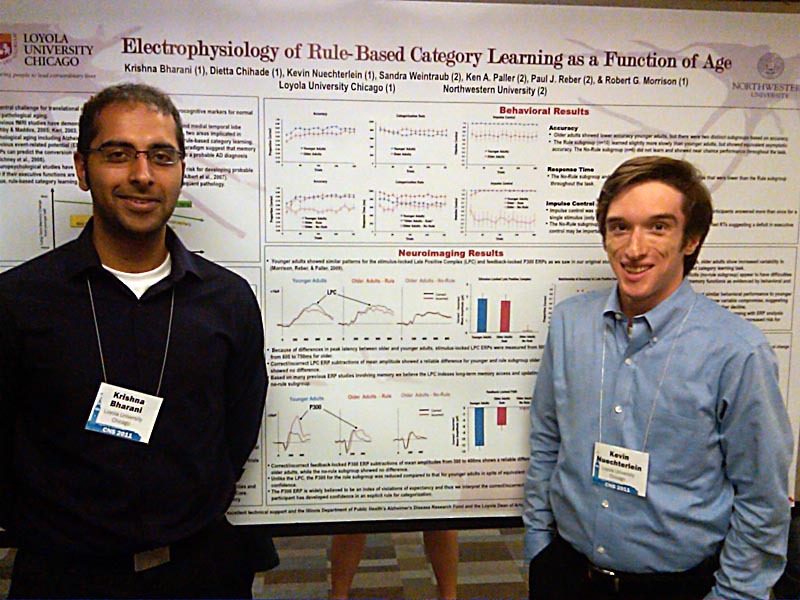 Below are several recent student projects presented by student lab members at the 2011 (San Francisco) and 2012 (Chicago) Annual Meeting of the Cognitive Neuroscience Society and the 2011 Cognitive Development Society Annual Meeting in Philadelphia. Click on the photo to get a better look at the poster. One characteristic of cognitive aging is an increase in variability for cognitive tasks with age. This has resulted in efforts to exam older adults exhibiting sub-standard performance for signs of pathology including amnestic Mild Cognitive Impairment (aMCI) or Alzheimer’s disease (AD). Early detection would allow for behavioral or pharmacological intervention prior to the debilitating pathology associated with the diseases. For the last several years my laboratory has been exploring the use of rule-based category learning with EEG monitoring for this purpose. The ability to learn and use categories is a fundamental property of the human memory system. Past functional Magnetic Resonance Imaging (fMRI) studies have suggested that rule-based category learning is critically dependent on prefrontal cortex and medial temporal lobe, two brain regions associated with aMCI and probable AD. Past neuropsychological studies have suggested that executive function in MCI patients predicts which patients go on to convert to a diagnosis of probable AD. Thus, rule-based category learning may be an excellent paradigm to detect and track MCI and possibly even predict which normal adults convert to aMCI diagnoses. Using behavioral and EEG methods in older adults with normal neuropsychological profiles, we have found a marked individual difference in both the ability to perform the task and awareness for task learning (Morrison et al. 2011). We believe that these differences may be related to anterior cingulate (ACC) functions and thus we are exploring additional tasks that recruit this brain area for which we can also collect behavioral and functional neuroimaging data. We are currently preparing a manuscript with the results from our first category learning study with normally aging adults and beginning data collection with both aMCI and AD patients. All of the participants in our studies are registered in the clinical core of the Cognitive Neurology and Alzheimer’s Disease Center (CNADC) at Northwestern University. As a part of this registry they have agreed to brain donation and have yearly neuropsychological evaluations. Most participants have also been tested for genetic markers for Alzheimer’s disease and had their brains analyzed for volumetric changes. We have access to all of this data and will longitudinally track participants to understand how these various factors predict pathologic aging. Below are several recent lab projects presented the 2011 Annual Meetings of the Cognitive Neuroscience Society in San Francisco, the 2011 International Conference on Alzheimer's Disease in Paris, and the 2009 Annual Meeting of the Cognitive Science Society in Amsterdam, Netherlands. Click on the photo to get a better look at the poster. The Gestalt psychologists first began describing the phenomenon of insight in experimental contexts and hypothesized that insight differed from other problem-solving strategies in that it did not utilize traditional trial-and-error testing. Frequently referred to as the “Aha or Eureka Moment”, the subjective experience of insight can be described as a sudden awareness of an answer accompanied by a sense of confidence in the solution. Our lab seeks to understand the neurocognitive and affective mechanisms of creativity in problem solving including insight. We employ a variety of techniques including traditional experiments, as well as physiological measures (e.g. EEG, GSR), and use these techniques both in typical college students as well as special populations such as bilinguals and experts in video gaming. Recent student presentation at the 2012 Annual Meeting of the Cognitive Neuroscience Society and the at conference from the Relational Thought group. Click on the photo to get a better look at the poster.